Hitachi Ink Jet Printers are high quality, robust printers intended for industrial applications. The printer's mode of operation is based on the Continuous Ink Jet (CIJ) principle. Our products are used for date coding, product marking and variable printing onto products used in everyday life. 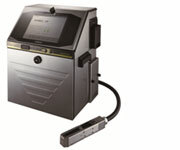 The new printer has been designed for ease of use and maintenance combined with improved environmental considerations. All models are equipped with a "Clean & Easy Cartridge-type System" and a new modern user interface with a full colour 10.4" touch screen panel and icon-based graphics. The Hitachi RX2 Series industrial small character high speed printer, categorized as a non-contact marking system, prints variable product information directly on various substrates. Hitachi Ink Jet Printer can provide you various type and color inks to meet all your requirements. Hitachi’s compact and affordable CO2 laser system offers a 10 or 30 watt power output. Wavelengths of 9.3 μm, 10.2 μm and 10.6 μm combined with various lens options allows coding on to various packaging substrates, including paper, cardboard, glass or plastics, at a very wide range of production speeds. The LM Series uses vector as well as dot matrix fonts with a user friendly font editing tool. Hitachi's Vision System MC-20S features a versatile, easy to use and quick starting interface. The forward-looking collaboration with Hitachi Printers means that the system instantaneously checks date and serial numbers for error.